Rising out of the Mediterranean Sea, nestled next to the Ducal Palace of Venice, lies the glistening St. Mark’s Basilica. During the time of Giovanni Gabrieli and his colleagues, music making in the basilica was renowned throughout Europe. The sound of dazzling violins, bright cornetts and mellow sackbuts heralded back and forth between the balconies to the amazement of all who heard them. Featured will be the brilliant and resounding multiple choir canzoni by Gabrieli and Giovanni Picchi and the stunningly virtuosic sonatas by Dario Castello. 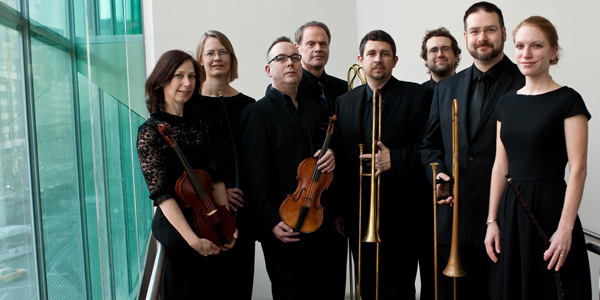 The early music ensemble Dark Horse Consort is dedicated to unearthing the majestic late renaissance and early baroque repertoire for brass instruments. Inspired by the bronze horse statues in Venice’s famed St. Mark’s Basilica, the ensemble attempts to recreate the glorious sounds of composers such as Giovanni Gabrieli, Claudio Monteverdi and Heinrich Schütz. Dark Horse often expands to include vocalists and strings, which when combined recreates the rapturous kaleidoscope that was the sound of the early 17th-century instrumental ensemble.